In March 2007, along with Patrick Mc Carthy from the Geneva Forum, I started the Disarmament Insight blog to help communicate the findings of UNIDIR's project on Disarmament as Humanitarian Action: Making Multilateral Negotiations work (DHA). At that time, I think none of us involved envisaged that more than two-and-a-half years later the blog would still be running, or that it would have covered the myriad of subjects it has - from the Conference on Disarmament to the cognitive constraints on negotiators, from export controls to explosive violence, nuclear disarmament to negotiation theory - in hundreds of posts from dozens of contributors. During that time we've witnessed an almost-complete turn-over of core contributors, with Patrick having shifted to UNDP and Maya Brehm on board at UNIDIR. Along the way, the blog became one respected source of news and analysis on international efforts to address the humanitarian impacts of cluster munitions, in particular. This emphasis on cluster munitions was only fitting: the UN's Convention on Certain Conventional Weapons talks and the eventual Oslo process that emerged in parallel underlined many of the points we were trying to make in the DHA project's work. The achievement of the Convention on Cluster Munitions in May 2008 was hugely gratifying, and obviously we believe lends weight to some DHA findings. Apart from launch events associated with Unacceptable Harm in December and January, the cluster munition project is now finished. Both Maya and I are taking a break while we wait for word on future funding for an exciting new project. It means that this will be the last Disarmament Insight post for a while. But keep checking the blog come December, and retain it on your list of RSS feeds as we anticipate news to come of various kinds including more information about Unacceptable Harm when it's out in print. Later today, the United Nations is hosting its second Special Event on the Convention on Cluster Munitions (CCM) at its Headquarters in New York. Apparently, the event is being webcast in real time (at www.conflictvoice.org) from around 13h15 New York time. The UN envisages the event, like last year's, to be an opportunity for States to come and sign and ratify the CCM, as well as express support for Lao PDR, which has agreed to host the First Meeting of States Parties of the CCM. In view of the swift rate of accession to the treaty, this First Meeting of States Parties is expected to be held sometime in 2010. (Article 17 of the CCM states that it "shall enter into force on the first day of the sixth month after the month in which the thirtieth instrument of ratification, acceptance, approval or accession has been deposited.") Already, 100 governments have signed the CCM and 23 have acceded to it, bringing the treaty within seven ratifications of the golden thirty. This is good going by the standards of multilateral treaties. Last year, Ireland introduced a resolution on the Convention on Cluster Munitions that was adopted by consensus (it did not go to vote). The 2008 resolution was procedural and requested the UN Secretary General to fulfil functions assigned to him under the CCM. This year Ireland and Lao PDR will co-sponsor a resolution which is expected to be similar to last year’s resolution but will additionally have a specific reference to offer by the Lao PDR to host the First Meeting of States Parties. Lao's leadership role on CCM-related matters is significant. Lao PDR is the world's most severely affected country from the post-conflict effects of explosive submunitions dropped during the South East Asia War of the 1960s and 1970s. It's support for the CCM is an extension of its view that the new Convention is an effective means to tackle these effects - not only in Lao PDR, but in other affected places around the world. environment, in which to develop, learn and play; while in the Lao [People’s Democratic Republic], although the war ended more than thirty years ago, the Lao people continue to bear its legacy and the Lao children are denied the basic rights to which they are entitled. Against this backdrop, the signing of this Convention is already one step forward to its realization, but at the same time, it is just the beginning of our journey to the ultimate goal of eradicating the scourge of cluster munitions and liberating the people and our children from fear and threat of such silent killer. Bringing the treaty into force internationally is another step in that journey. Hopefully today's special event in New York acts as a spur to more States to join and begin implementing the CCM. Last year's First Committee resolution text on the CCM is here. The civil society project 'Reaching Critical Will' publishes monitoring reports on the First Committee online here. 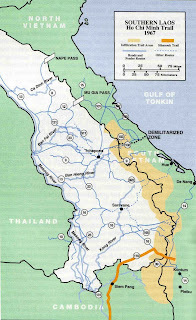 Image from Wikipedia depicting a map of the Ho Chi Minh Trail traversing Southern Laos in 1967. American and allied forces bombed Lao heavily to try to interdict supplies moving along this trail toward North Vietnam, including with millions of cluster submunitions. On 29 May the Conference on Disarmament (CD) adopted its programme of work for 2009 after a 10-year gestation period (as recorded on this site on 18 June). That heady moment of four months ago is not easily forgotten despite the ensuing anti-climax. The work programme (CD/1864) wasn’t, it turned out, quite still-born. But unfortunately it expired when the CD’s annual session came to an end in mid-September. “Expired” might be too strong a word to describe the fate of the decision. It certainly lay dormant on the table while CD Members sought to give it life by agreeing on the seven individuals who would co-ordinate work on seven major issues and on a timetable that would fairly reflect the hierarchy of treatment accorded to those issues in the programme of work. Their efforts, however, were in vain. But this outcome need not mean that CD/1864 has entirely expired. There is no disputing that agreeing the work programme is an annual event. (What is actually contemplated by the term “programme of work” is another question, and will be addressed shortly.) For better or worse, the rules of procedure require both the agenda and the programme of work to be adopted at the beginning of each yearly session. More accurately and significantly, the Conference shall “establish” its programme of work (rule 28) rather than “adopt” it (as is the case of the agenda according to rule 27). The agenda is regularly rolled over or renewed from year to year, and it is similarly open to the CD to accept that, with an obvious change of date, the work programme established in 2009 can be refreshed in its entirety for 2010. Such an outcome is devoutly to be desired if the CD is really serious about pursuing a comprehensive programme embracing a range of issues of central importance to improving international peace and security. The only circumstances in which a Member might require the 2010 version of CD/1864 to be revisited would be if some sea-change in the international security environment were to occur before the next session of the Conference. This outcome served to cast a further cloud over the operation of the CD’s consensus rule (rule 18 of the Rules of Procedure), and it would be equally disturbing were Pakistan’s reservations to be revived next year and pressed to the point of objecting to what would effectively be an extension to the life of CD/1864. A question, however, that the membership of the Conference needs to ask itself in the meantime is why it has acquiesced in elevating matters of implementation of a formal decision to the same level of decision-making that it chose to apply to the work programme itself. As each week passed without resolution of the proposed timetable, it was very painful to witness the CD having to lop another five working days off its schedule, running it down until the opportunity to give effect to CD/1864 was lost altogether. The burden of negotiating a way forward via a further formal decision was placed heavily – and unfairly so – on the Conference’s Presidents shuttling ever industriously between the nay-sayers and representatives of the overwhelming majority of the CD for whom substantive work cannot begin soon enough. On the face of it, the task of implementing CD/1864 was not complicated. Indeed there seemed to be no difficulty with any of the proposed chairs and co-ordinators, at least not until the appointment of the seven individuals was linked with the timetable by which those office-bearers would carry out their work. Had the office-bearers been appointed first, the meeting time for their subsidiary bodies could have been divided equally, pending future adjustments based on the pace of the progress in their work, if warranted. Unfortunately, the timetable became a battleground on which attempts were made to re-litigate the very decision that was in the process of being implemented. This strenuous rearguard action, in other words, had as its objective a re-jigging of the subtle hierarchy of treatment of issues so carefully crafted in the May work programme by Ambassador Jazairy and his fellow Presidential colleagues. The dispute over how to fairly reflect - or “balance” - that hierarchy in the timetable warrants close analysis as Members gear themselves up to getting the CD underway in 2010. Several matters arise for debate. First, in the case of a comprehensive series of mandates or programme of work such as CD/1864, is it wise, or even feasible, to prescribe in advance a detailed timetable that can anticipate every eventuality? Changes along the way will be required whether they are brought about by the need to accommodate a visiting dignitary or to reflect qualitative changes in the intensity of the activities of any one or more of the Working Groups. Secondly, there is nothing in the Rules of Procedure that requires the CD to take a formal decision on either the office bearers or the daily conduct of the activities of the Conference. These matters should be left in the hands of the President in the certain knowledge that no President would be rash enough to proceed to announce the way ahead on either front unless his or her consultations had established that all Members could agree with, or tolerate, the proposed timetable and list of office-bearers. The mandates of subsidiary bodies must, however, be formally agreed, but that rule was clearly met in CD/1864. Thirdly, why does the CD allow itself to be held hostage to matters of procedure when the mandates for dealing with substance have already been agreed? In the Conference, it is true that matters of procedure are inextricably linked with substance, and this is certainly the case when it comes to developing an appropriately balanced timetable to implement the mandates set out in the work programme. But the balance that is being sought must be responsive to the qualitative differences in the mandates contained in CD/1864, and above all, to the progress achieved in the subsidiary bodies, rather than to the notion of “equal and balanced allocation of time” in CD/1873 tabled by Pakistan almost 3 months after the breakthrough on the work programme. In reality, the CD has allowed confusion among various procedural requirements to dominate its existence. Current practice is surely not what was intended by the Rules of Procedure. Why would one want to handicap the CD by having it take formal decisions on its agenda, its programme of work, the mandates of its Working Groups, its timetable and its office bearers before it can actually conduct substantive work? The tail is wagging the dog. The Rules of Procedure, as well as CD/1036 (the decision on the “Improved and Effective Functioning” of the Conference adopted on 21 August 1990), envisage a much more streamlined and sensible process whereby the programme of work would be no more than that which its literal interpretation suggests, that is, a mere programme rather than an overarching mandate. CD/1036 led to the current rule on the work programme, rule 28, with its emphasis on establishing rather than adopting. This is not a matter of semantics. It contemplates that mandates such as those contained in CD/1864 could be given effect through the efforts that a President would undertake in establishing through his or her consultations that no reasonable objection exists to the proposed manner of implementing the decision on the Working Groups’ mandates. No-one underestimates the complexity of the substantive work facing the Conference. But surely that challenge will be less debilitating and damaging for the CD as an institution - and for the standing of its Members - than any prolongation of the charade of elevating the implementation of a formal decision to the same level of decision-making as for the work programme (i.e., mandate) itself. The immediate way ahead requires a greater readiness among Members to address the CD’s current problems on the floor of the Council Chamber rather than leaving it to successive Presidents to work miracles behind the scenes. 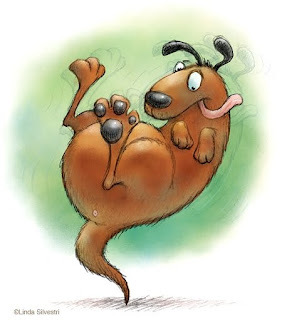 Image Credit: "wag the dog" by Linda Silvestri from her blog "sketched out - drawing on my perspective".